Tocopheryl Linoleate - A vitamin E/fatty acid derivative that helps keep the skin moist and supple by enhancing the skin’s natural barrier to help prevent moisture loss. Algae Extract - An extract derived from a wide variety of plants grown in seawater and fresh water. Helps normalize the skin’s moisture content and provides skin-softening, remineralizing vitamins and antioxidants to the skin. 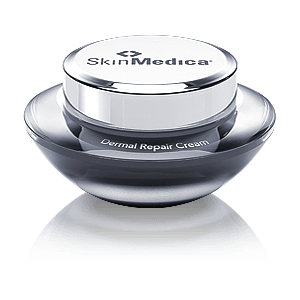 A:Dermal Repair Cream is appropriate for normal to dry skin types. This ultra rich facial cream intensely hydrates and replenishes skin. It's also perfect for use during periods of dry weather or as a night time moisturizer. A: Dermal Repair Cream should be applied twice daily after cleansing, toning and applying treatment products. A: You can use Dermal Repair Cream as long as needed to improve the overall condition of your skin. A: Dermal Repair Cream contains high levels of antioxidant vitamins C and E, along with highly effective moisturizing ingredients to provide unparalleled hydration.